A Democrat who’s running for governor says the state doesn’t have enough information to make an informed decision on Foxconn. 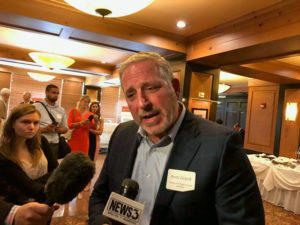 Milwaukee businessman Andy Gronik participated in a Wispolitics luncheon in Madison, where he was repeatedly pressed about the state’s three billion dollar incentive package for Foxconn — and how he’d vote on it. Gronik, one of five Democrats who’ve officially launched campaigns to challenge Walker in 2018, said the governor has no long-range plans for things like rural broadband, K-12 education, and transportation infrastructure.